Know your arsenal – we’re listing the tools of the trade you’ll wield at launch. In the explosive, dynamic sandbox that is the Battlefield™ series, it’s always been vital to know what’s in your arsenal. There’s a gun for every situation, a vehicle for every fight, and helpful gadgets to aid your squad in unique ways. In this post, we’ll go through what you’ll wield, pilot, and utilize when Battlefield™ V launches. At the heart of this is your Company – your personalized collection of soldiers, weapons, and vehicles, earned and improved in your journey through World War 2. Let’s gear up and see what means you’ll have to master the rock-paper-scissors gameplay of the series’ next installment. 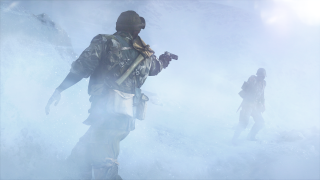 Depending on what Class you’ll deploy as, you’ll have access to a wide range of weapon types in Battlefield V. In our newly published articles on Classes and Combat Roles, you can discover which of the 30 primary weapons that the Assault, Medic, Support, and Recon Classes can wield. SMGs and Shotguns are heavily specialized into close range, with the latter even allowing you to sometimes one-hit kill enemies. Assault Rifles are the bigger brother of the SMGs, with better accuracy and damage at range, making them more suited for medium range. LMGs are optimized for sustained fire. They have worse mobility then Assault Rifles but tend to be a bit more ranged thanks to their bipods. MMGs are heavily specialized to provide the most lethal sustained fire. Their mobility is poor, so make sure to set up on a bipod. Then there’s the Semi-Automatic Rifles, generally more ranged than assault rifles, but not necessarily long range. The Self-Loading Rifles are mechanically similar; they have a lower rate of fire, but higher damage per shot and a much smaller magazine capacity. Bolt-Action Rifles serve as the sniper rifles of the game. Their rate of fire is low, but they will take out an enemy with one headshot. Here are the 30 Primary Weapons available when Battlefield V launches. StG 44 – Considered by many to be the first real assault rifle. It combines a high rate of fire with good accuracy and stopping power. Sturmgewehr 1-5 – The selective-fire variant of the Gewehr 1-5 semi-automatic rifle. M1907 SF - Similar to the M1 carbine, only heavier and more powerful. Selbstlader 1916 – An early German semi-automatic rifle whose sensitivity to field conditions made it more popular with the German air force than its army. Only 1000 were ever made. Gewehr 43 – A rifle so sturdy it can be used as a ladder rung if needed. Gewehr 1-5 – A semi-automatic rifle that used the same detachable magazine as the StG 44. M1A1 Carbine – Very fast firing Semi Auto with a rather weak bullet. Best used within 50 meters. Turner SMLE – Fires faster than the Gewehr 43 but has a weaker bullet at range. Gewehr M95/30 – This rifle’s origins date back to the late 19th century and saw heavy use in World War 1 by the Austro-Hungarian Army. Krag-Jörgensen - A rifle dating back to the late 19th century, with a special type of integral magazine which loaded from the side rather than the top. Lee-Enfield No. 4 Mk l - Very fast firing sniper rifle. Its bullet is significantly slower than that of the Kar98k, making it preferable for medium range. Kar98k - The most common bolt-action rifle in the German army. Model 8 – Created in 1900. US hunters and some police units would use it, but it was never formally adopted by the US Army. ZH-29 - A hard-hitting self-loading rifle that can kill with only two hits. RSC - By repurposing parts from the Lebel rifle it was designed to replace, the RSC was cheaper to produce for the French army, though there were complaints that it was unwieldy in the trenches. STEN – The easier to control twin of the MP40. Suomi KP/-31 – Very hard to control, fast firing SMG. It starts off a bit weak, but benefits more than other SMGs from progression. EMP – Developed in Germany, this submachine gun proved immensely popular across Europe and Asia. MP40 – The Allies called this popular submachine gun the "Schmeisser" although well-known weapon designer Hugo Schmeisser was not involved in its creation. MP28 – After World War 1, Hugo Schmeisser made many improvements to the MP18, such as replacing the drum magazine with a straight one. The resulting MP28 was sold to both China and Japan among others. MP34 – The MP34's design was based on the old MP18 submachine gun. Used primarily by the German army, it was an extremely well-made gun although the production costs were very high. M1928A1 – The Chicago gangsters made the "Tommy Gun" famous in the 1920s. The US Army adopted it in 1938 for its accuracy and high rate of fire, and Allied Commando and Ranger units used it extensively. KE7 - Medium rate of fire LMG. Even though this light machine gun was designed in Switzerland, the Swiss army never used it. Bren Gun – Based on a Czechoslovak design, with a top-mounted box magazine which gave it a distinct look. FG-42 - Very fast firing automatic rifle with a small magazine. Highest damage output weapon on the support kit. Lewis Gun – Entered Allied service in 1914. In World War 2, the British again used it as an anti-aircraft gun. Its barrel shroud and top-mounted pan magazine made it easy to recognize. MG 34 – The first of a kind: a portable, air-cooled machine gun with a high rate of fire. Too complex to properly mass-produce, it was later supplanted by the MG42. MG 42 – This machine gun was reliable, easy to use, and had an extreme rate of fire. After its introduction in 1942, it was used on all fronts. M30 Drilling - A triple barrel combination gun that leaves you more flexible than you would think. Use it as a double barrel shotgun in close quarters or change fire mode to the rifle barrel for medium range shots. 12g Automatic - Served in both world wars. It was the first successful semi-automatic shotgun used by the Allies, eventually inspiring the German army to create their own version. The base weapons are just the start. With Specializations, you’ll be able to tailor your weapons to cater for your particular play style. As you unlock these Specializations by playing Battlefield V, you can affect how your weapon behaves when it comes to damage, accuracy, hip fire, control, and so on. Note that this system does not improve your weapon to an ultimate “master of all trades” level. If you decide to add a Specialization that increases fire power, it will not get the bonus of, for instance, stability that another Specialization path would give you. Our design philosophy is that Specializations will never give players an unfair gameplay advantage. Stay tuned for more details on weapon customization, coming before launch. In intense shootouts, when there’s no time to reload your main weapon, you may only have a split second to make it out. That’s when you reach for your sidearm. Find your favorite among these reliable pistols and revolvers. When ammo needs to be saved, or a loud encounter would be fatal, you need alternatives. Go for the melee win with finessed weapons or blunt, improvised instruments – you'll grab your enemy's Dog Tag if you succeed. Help out squad mates with crates full of ammo or medical supplies. Or bring mayhem to the enemy team’s soldiers and vehicles with TNT or Tellermines. A clever use of gadgets can rack up tons of points for you – and even win the match for your team. If the situation is dire – and you have enough Squad Points collected – you can call in mighty Reinforcements. Two dreaded heavy tanks, for instance, or the Rocket Strikes that will send enemies flying and XP your way. Play it tactical and go for the Supply Canister Drops, full of health and ammunition to your team. The battlefield may shape you – but you can bally well shape the battlefield too. Tow an anti-tank gun to a key area of the map or man an AA Gun to bring cocky pilots down to earth. In Battlefield V, Legendary World War 2 vehicles are waiting for eager players to get behind the wheels or man the cockpits. 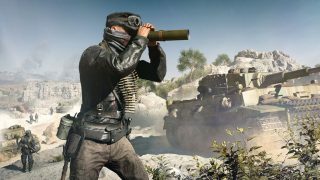 You can look forward to authentic tanks, halftracks, fighters, bombers, and other vehicles from the era that will let you get around and bring terror to the fighting grounds. Your arsenal may be powerful, but vehicles don’t make you invincible; watch out for Assault enemies and make sure to bring both ammo and wit when attacking. Study the list below and find your favorite ride. We hope you’re looking forward to all this WW2 hardware coming at the Battlefield V premiere. Remember, though: this is just the beginning. 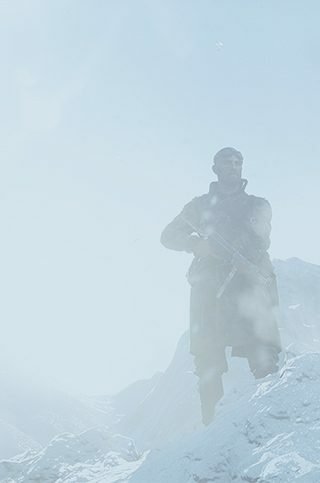 More gear will drop as your Battlefield V journey continues, as will more fronts and challenges. We can’t wait to see you make good use of it all. Deploy with a special tactical loadout – pre-order Battlefield V and get the Firestorm Ranger Set*.